Whether you like it or not, vertical videos are becoming increasingly popular and will continue to gain traction. This is in large part due to their ease of viewing on mobile devices and, furthermore, social platforms. Our smartphones were built to be held with one hand and in portrait orientation. Therefore, apps and content should follow suit and be optimized for that environment. It’s different. Just because we’re not used to vertical video doesn’t mean we won’t adjust. Prior to widescreen, 4:3 aspect ratios were popular. Before flat screens, tube TVs were all the rage. Vertical video is just another step on the path of technological growth. Unlike tube and flat screens, vertical videos can and will coexist with horizontal videos; this doesn’t have to be an exclusive environment. Even though it takes some getting used to, eventually we will hardly remember a time when all video content was horizontal. It’s thin. This is the first time in a few decades thin has been “problematic.” Just like the red carpet, the slimming styles of vertical video are really working for content. Widescreen formats can fill the screen with distractions, but vertical layouts allow the viewer’s eye to focus on the product. It’s easy. As noted earlier, we’re already holding our phones with one hand in portrait orientation—who wants to flip their device and hold it with two hands to absorb video content? Not me, and probably not you… which means the rest of consumers don’t want to either. This leads to another controversial video topic (for another day): Do we need to use top-notch equipment for all content creation? For this discussion, let’s say no. A huge perk of vertical videos is transparency. 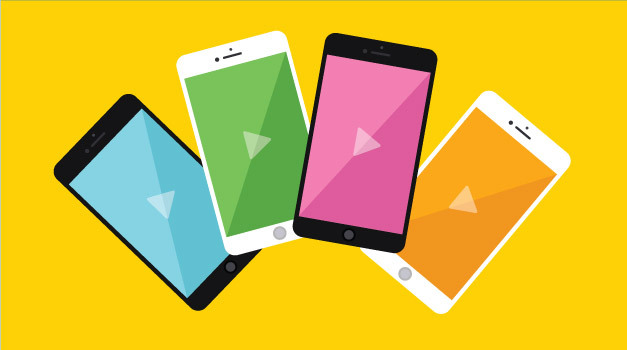 We know that if we’re watching vertical content, it’s probably coming straight from someone else’s mobile device. That means minimal editing, no big-budget studio, just simple content straight from the company—and that’s pretty refreshing. It’s focused. In an age where we need instant gratification and have small attention spans, short videos aren’t always enough. But a quick, 10-second vertical ad on Snapchat or an Instagram Story leaves us with a good sense of the product and, if done correctly, wanting more. It’s social. Social platforms are designed for portrait mode devices. Think about it: the original social platforms were newspapers and magazines. Let’s say you are a company who always had half-page ads. Now let’s say you got a budget increase and you are now buying the back cover. Prime real estate! You wouldn’t pay for a full-page ad and then fill half of it because you only had horizontal images. You would go out and get a photographer to shoot some vertical images and redirect your campaign to match the new layout. That’s what vertical videos can be for social platforms! It’s vertical video! And it’s an investment in trends and technology that are going to continue to evolve. Stop paying for the full-page ad and only using half of the space. Go vertical or go home.